The occasional craving for Japanese Food struck. 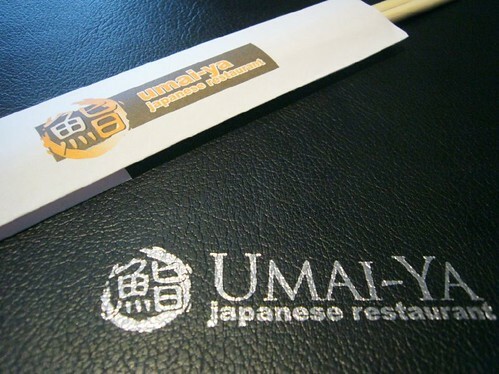 Umai-ya seems like the right place because we aren’t looking to spend that much or venture out of the neighborhood. 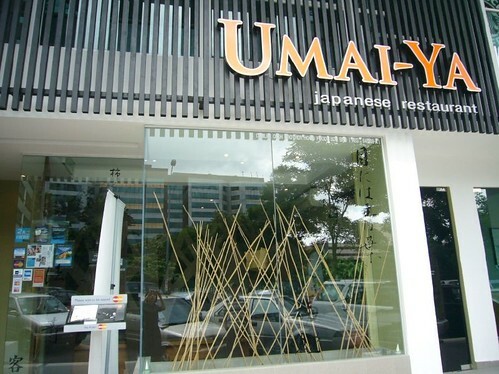 Situated next to Izzi, Umai-ya is occupying two floors and has a casual, subdued feel to it. The restaurant uses the “tatami” style seating where you’re sitting on an elevated dining room sunken well for your feet. 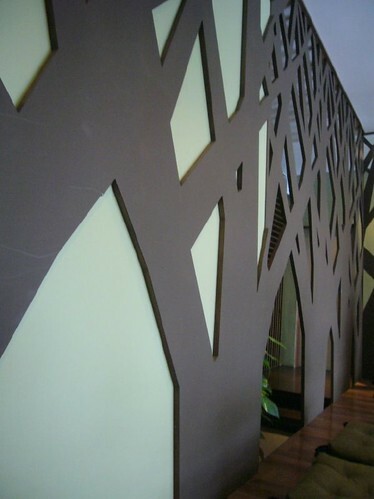 The buffet menu is available on Saturday/Sunday from 11.30 am to 2.30 pm where it is priced at RM 45++ per head. Since it is a quiet Monday, we go for the bento set to enjoy 15% discount (15% off for all bento set on Monday, Wednesday and Friday). CK ordered the fried rice set with fried kushiyaki while I opted for the grilled mackerel set. 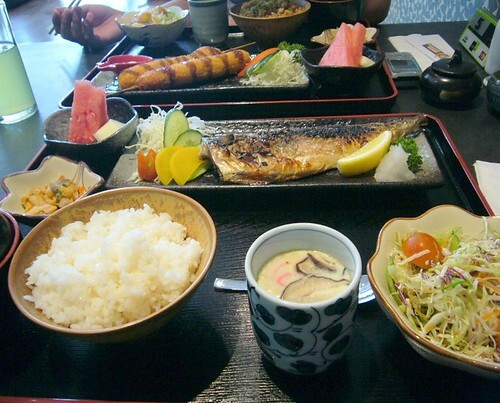 Every bento set is pretty standard, it comes with a very refreshing vege salad, smooth and silky chawanmushi, a bowl of miso soup and a small fruit platter. 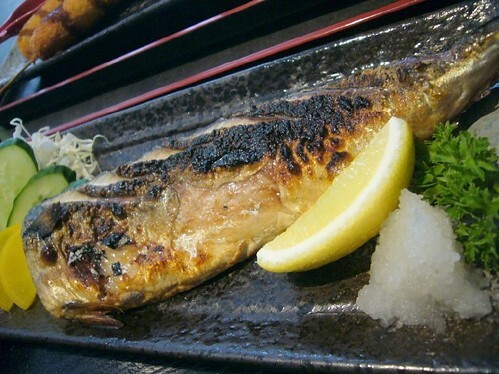 Slowly grilled to perfection, the skin blistering and slightly charred salted mackerel is so juicy! I finish every bit of the flesh until nothing is left attached to the fish bone. A squeeze of lemon give it a slightly sourish taste and reduce the oiliness of the grilled mackerel. 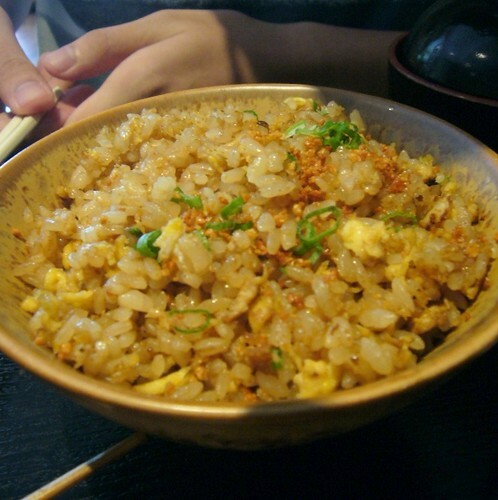 The fried rice, according to my friend, is flavourful and aromatic. 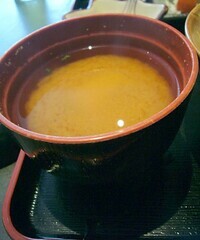 However, it would be better if the rice is served soft and fluffy instead of wet and clumpy. 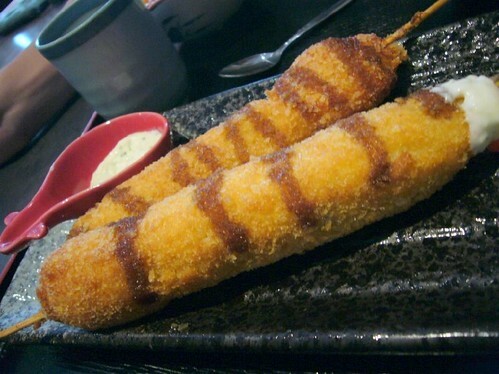 Kushiyaki is actually breaded seafood or poultry in a skewer. With generous portions of filling piled into the skewer, CK is having a hard time to finish it off. Umai-ya’s bento set and buffet definitely fits the bill as well as being easy on the pocket but the ala-carte item is price at the higher side. The staff is very helpful but unobtrusive by refraining me from taking pictures. (GRRRR). 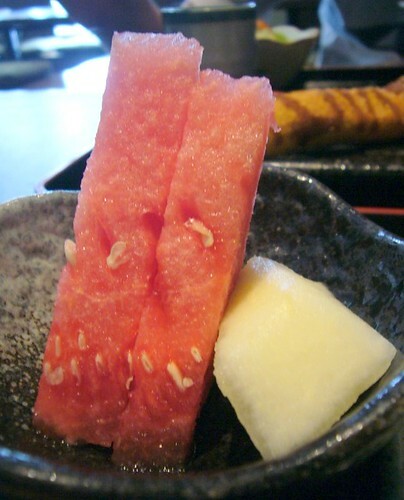 I feel that the food falls in line with the Japanese cuisine style, but nothing is a specialty on its own. Hmmm. I’m surprised that they didn’t like you taking pictures. I thought Umai-Ya welcomed publicity. mmmm….seems like a good place for a jap fix. what is the price range of the sets? 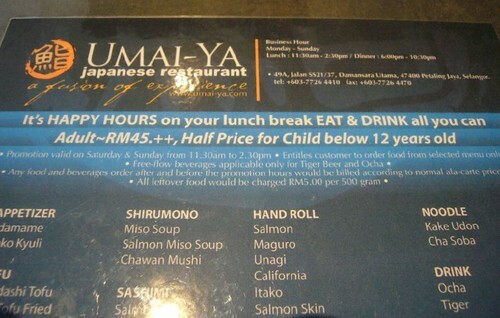 this must be a new Japanese Restaurant at Uptown,cos i never notice this Jap restaurant before. you did manage to take a lot of photos tho 🙂 good job! 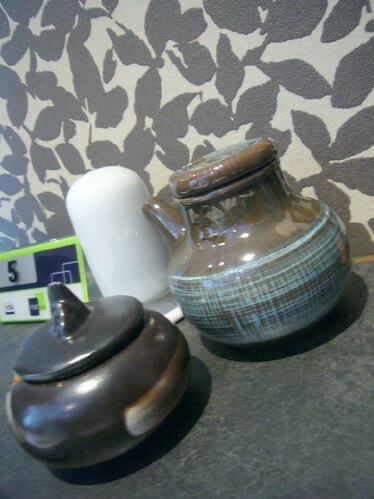 lemongrass: im not sure, whether its their policy or that particular waitress is being bossy? i went for the buffet with my friends last weekend. 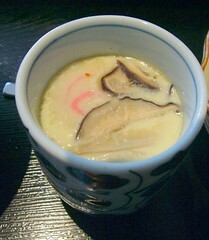 food was great, but better don’t order any shushi before you finished all other dishes, heehee. 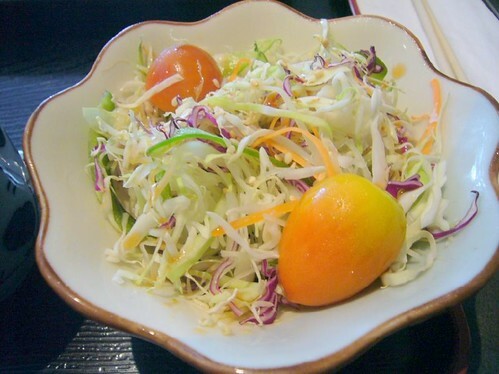 the shushi is kinda normal and there are a lot of special dishes. there are 2 kind of hotpot kinda like steamboat included too!! If u guys want to go umai-ya don’t order the promotion set especially the rm150.00++ dinner set for 4pax coz it really not worthy and u will regret at the end. saw the blog above.. its all 2007.
is it worth going? better than Rakuzen & Tenji? something wrong with the year and dates? Hi, I’m sorry to hear about your bad experience. Actually we did experience that from our revisits, 2 out of 5 of our mains never come and we talked to the lady manager. Apparently, they forgot about our order and we were so pissed off that we went somewhere else to continue our dinner. I hope that the restaurant will take note of this manpower/staff issue during peak dining time. I am specialised in Food & Beverages Outlets Design Solutions for logo, menu, website, brochures, catalogues & etc. I have a referral program to offer you! Kindly contact me at 012-2208727 for more details. hey, just to let you know the number given is wrong, it linked to Umai yu. Let’s all try Karaage Japan, their karaage is delicious… Great Deal @ Karaage!